This particular blog relates to the commission of a fully bespoke and unique kitchen we were asked to create. The customers had approached multiple mainstream kitchen manufacturers and left their showrooms feeling unsatisfied with the style of kitchen doors and drawers on offer. After a quick google search for alternative local options the customer reached out to SoloWood to create the kitchen of their dreams. 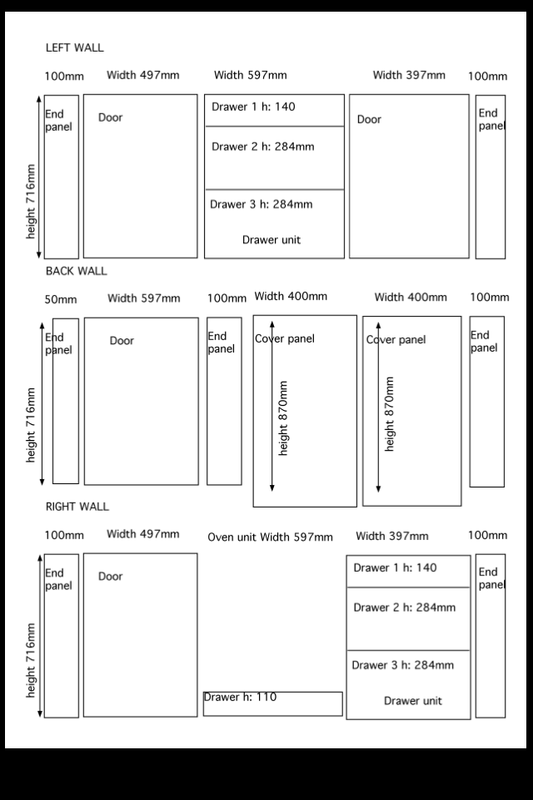 Below is a picture of the kitchens dimensions. We arranged a consultation at their earliest convenience for us to better understand their tastes and requirements and ultimately deliver a better final product. 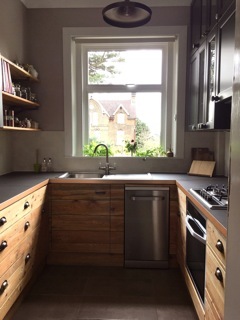 Using reclaimed material requires a lot of discussion and customer involvement because the range of materials can be incredibly varied; As a consequence the material selection process can take longer than conventional design consultations. Furthermore, people new to the concept of upcycling and wood reclamations often have a lot of questions about the materials history and the processes involved in its reclamation. Questions such as these can take time to address properly and will often be an ongoing discussion with the customer throughout the projects duration. 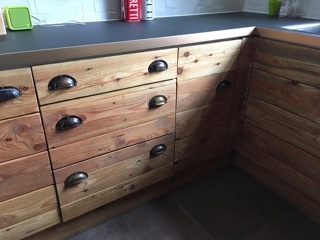 From our consultation we ascertained that the customer wanted a rustic and warm set of solid wooden doors, drawers and end panels to be fabricated. We were sent plans and measurements of the kitchen space that needed to be covered and began the process of narrowing our potential materials down. I pointed out three possible materials that would be perfect for the customer’s desired appearance. 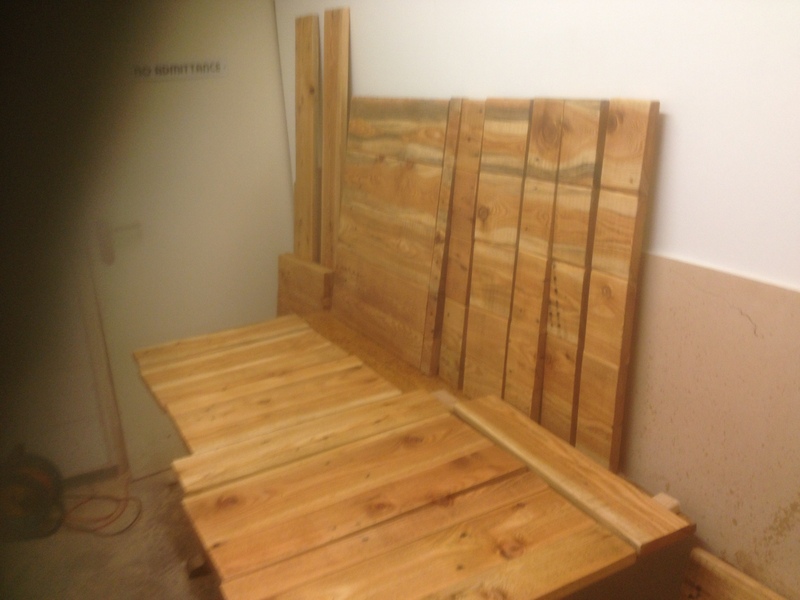 These included; sun bleached cedar wood that had begun life as a shed 20+ years ago and had a beautiful silver tone to it, pallet wood that always offers a lot of colour variation and character and a huge 3.5×2 metre shipping container. After a few mock ups of the potential materials into examples of kitchen doors, it was decided that the shipping container would be the most suitable reclaimed material because of its thickness. After sanding the thickness of the material would have been reduced further, possibly by as much as 0.5cm or more depending on the woods condition. 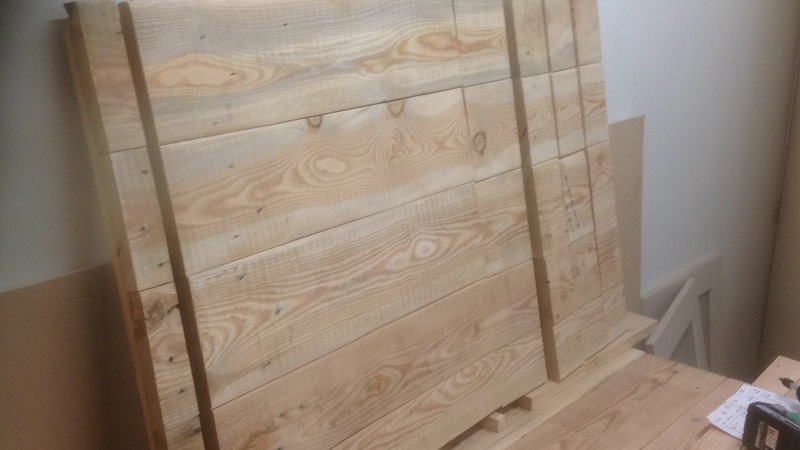 Any regular kitchen door will require roughly a minimum thickness of 1.8cm to install its hinges; the pallet wood and cedar were only 1.5cm to start with rendering them unusable. Therefore the shipping container was selected. The dimensions of the shipping crate (3.5mx2m) presented me with a unique opportunity. The total length of the kitchen units from left to right did not exceed 3.5m so I suggested that the material should flow from one end to the other. This would give the appearance of a continuous and solid piece of wood when everything was closed and allow the grain to span across the kitchen from left to right. This simple and elegant suggestion vastly increased the complexity of the project. I had to improve my labelling system as the organisation of all the individual pieces would be integral to the finished look. At one point the kitchen was over 100 individual pieces of wood waiting to be assembled. For most projects labelling isn’t too much of an issue but in this case any piece of wood out of place would be immediately obvious and ruin the aesthetic of the whole piece. When it came to joining the materials together there were some complications that were not included in the original plan. The compartments where several of the doors were planned to go contained typical kitchen items such as washing machines, fridges etc. this therefore made them unsuitable for battened doors as the door itself would be unable to close where the batten would hit the unit it was meant to conceal. As a result we were only able to batten two of the four doors and several end panels but the vast majority of the design required biscuit joining. Biscuit joining is a technique that requires cutting a specific hole into wood that is designed to fit a small piece of wood into it referred to as a biscuit, hence biscuit joining. The holes on either side are filled with glue and a biscuit is placed into one hole, they are then brought together and clamped tightly and allowed to dry creating an exceptionally strong bond between the formerly separate materials. In terms of labour and time, biscuit joining can be very intensive but in this case it was unavoidable. The project was nearing completion but the extent of biscuit joining necessary to complete the job had stretched the customer’s budget almost to its limit, and the piece was yet to be given any kind of finish. As with every stage of the project we began by consulting the customer about their taste and desired finish, offering several demonstrations of what finishes would look like by applying them to offcuts. This is the best way to test the appearance of any finish before applying to the intended material itself. The original idea was to apply a clear varnish to the wood but this would take us over budget as varnishing requires a lot of care and attention. 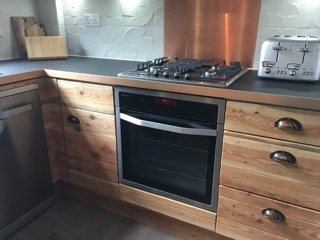 Based on our advice on how best to stay in budget the customer instead opted for the kitchen to be finished with Superior Danish Oil. Oiling wood is far easier than varnishing as the oil itself is relatively self-spreading and will not pool into drips the same way varnish will, reducing application time massively and reducing labour costs associated with finishing. The final product was completely to the customers taste and more than satisfied their desire for a unique and bespoke kitchen design.